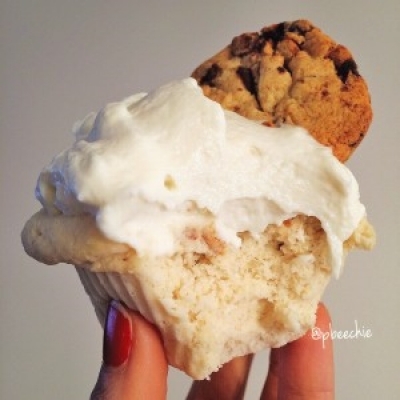 Once upon a time, a Daddy Sâ€™more loved a Mommy Cupcake very very much. And they made beautiful things together, as documented here. The end. Mix all of your ingredients except for the SMORES quest bar, breaking apart any lumps that may occur. Break apart the quest bar into pieces and swirl it into the batter. Spray a mug with nonstick spray and pour your batter in. Microwave 1:45-2:00 mins. I used two small silicon cupcake molds instead of a mug, but a mug is what I usually use. I just wanted to be cute. For the yummy icing, mix 1/3 cup plain greek yogurt, 2 tbsp vanilla quest protein powder, and 1 stevia packet. To make the cookie on top, mold 1/4 sâ€™mores quest bar into a circle. Bake at 375 F for 7-8 minutes, or until crisp.